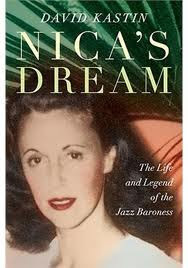 Nica’s Dream: The Life and Legend of the Jazz Baroness (Norton) is one of those books that you wouldn’t find credible if it were fiction. It has everything a good story requires. And more. A glamorous baroness from a famous family. She is a pilot, mother to five children and a former fighter in the French resistance. Then she hears jazz music and is entranced: terminally. The music -- and the people who make it -- will alter the course of he life. She styles herself as a patroness of the arts which, in the case of jazz music at the middle part of the last century also means she becomes a fighter in the rights of racial equality. From the moment jazz first infiltrated mainstream popular culture, it was perceived as a serious threat not only to the prevailing social order but to the integrity of Western culture itself…. Of course, it was precisely such sentiments -- along with the music’s intoxicating rhythms -- that captivated young people on both sides of the Atlantic. Music historian and educator David Kastin (I Hear America Singing) brings a deep knowledge of music and a storyteller’s passion for his tale to Nica’s Dream. “Whether frozen in Weegee’s tabloid flash,” Kastin begins, “or shrouded in the murky chiaroscuro of the era’s low-budget movies, New York in the 1950’s is a city in black and white.” And we’re entranced. Is the Kindle on Fire?